Hello! I found out that my dear on-line friend Ellie was chosen as Splitcoaststampers Featured Stamper this week, so of course I had to play along. HERE is the card I cased. I picked this card because I was drawn to the title; my name is Amy and I love kitties! But I also love the color and clean simplicity of the card. So below is my interpretation: of color, clean and simple style! I used a dollar stamp by Studio G. I kept the same layout, using lots of clean white space with fun colors. 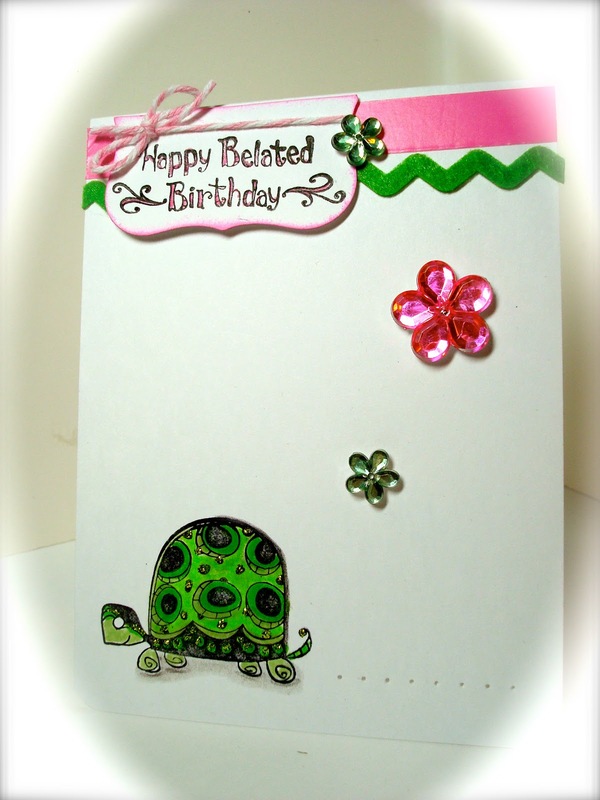 I pierced a trail behind the turtle to add movement, and also because Ellie used piercing on her card too. The green ric rac is made from felt and is by Martha Stewart. The pink strip is Washi Tape....the first time I used the stuff! The flower are acrylic and are from the dollar bins at JoAnn's, and I used baker's twine to tie a bow on top of the card. You can't see it in the photo, but I rounded the corners on the card to mimic the round shell of the turtle. Adorable card, Amy, and I love that combination of colors! Thanks for sharing, and congrats to your friend Ellie! Oh great, love the image, so cute for a belated birthday, love the c&s style ! Oh the turtle is perfect for the belated wishes and he is darn cute too! Sorry I am just now getting around commenting on this cutie. I'm so happy you played along in the featured stamper challenge where I was featured! Love the turtle, you colored him so beautifully, and the sentiment is just perfect too, and love the ribbons, washi tape and twine. I haven't gotten any washi tape yet, but I think I will soon. The Iris are in BLOOM!